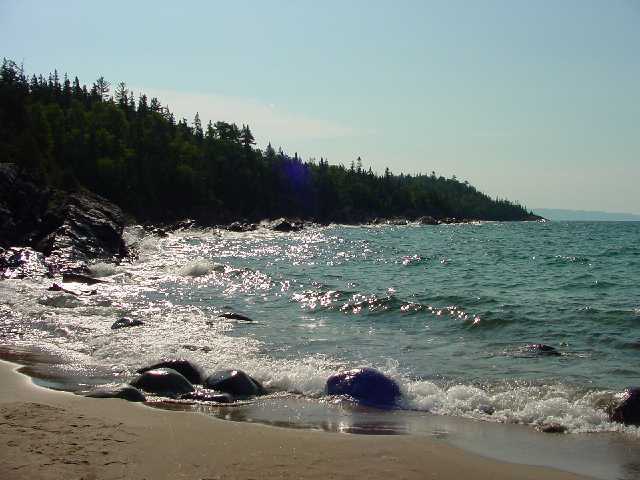 Our favourite place in the world is Lake Superior. It has entranced and beguiled us and every year we are drawn back to canoe over her crystal depths. 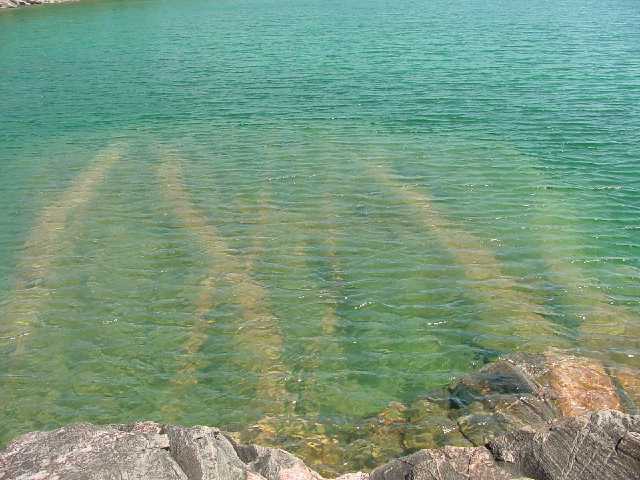 The biggest lake in the world, the home of the mystical native lynx-spirit of Misshepezhieu, the resting place in her "ice-water mansions" of shipwrecks like the Edmund Fitzgerald, the home of loons and eagles, the place of mist and legend that draws you in and tries to spit you out. You had better treat her mercurial spirit with respect. This has been proven to us every time David and I take Kicking Frog out onto her surface and this year again we experienced her shifting moods and elusive tranquility. Pleasant? Wrong word! 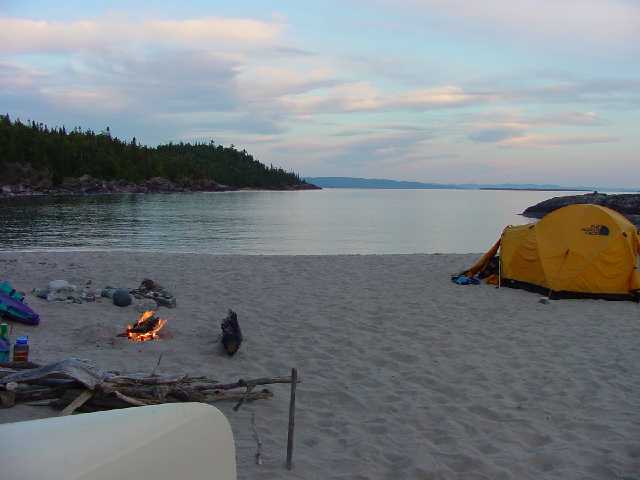 We were driving north for a two week canoe trip in Quetico Park and decided to spend 3 days in the Baldhead River region of Lake Superior Provincial Park. We stopped at Old Woman's Bay to admire the cliffs and evoke the memory of Bill Mason, staring out at sparking, perfectly flat blue water of the lake. 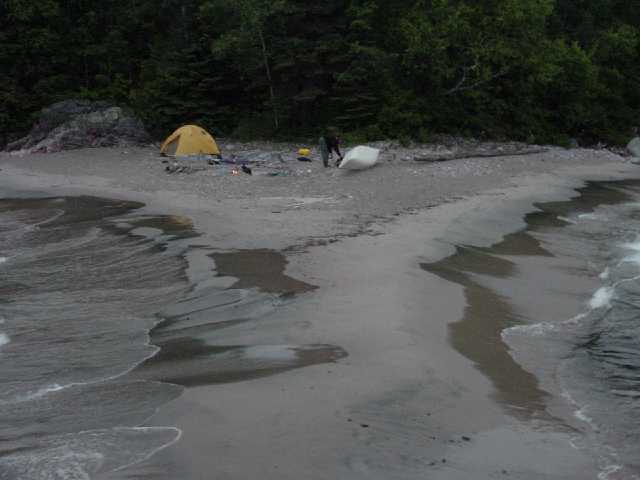 On the beach were a number of adventure racers who had briefly stopped on their way from Wawa to Batchewana Bay. As it was late afternoon, we knew they would be paddling by moonlight and wished them well, knowing how lucky the organizers were to have dead-flat conditions. We proceeded onto the Mystic Isle Motel in Wawa and the next morning were driving back eastward towards our put-in near the Baldhead River. 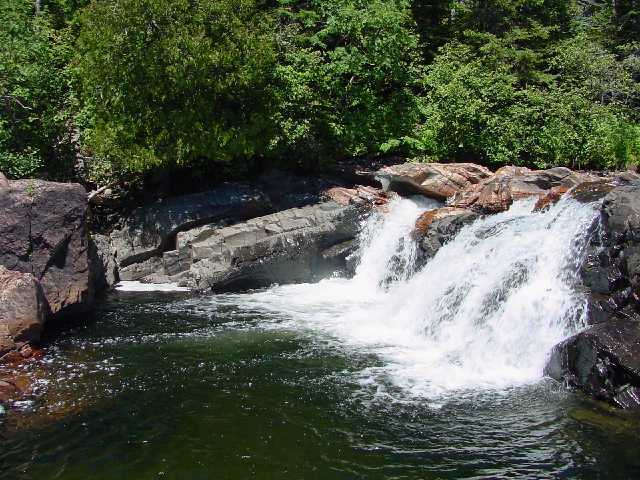 Several years ago when exploring the coastline of Lake Superior Provincial Park, we had really enjoyed camping near the falls, marveling at their beauty and swimming in one of the pools underneath the cascading water. We had seen a fellow camper catch some trout near the top and were eager to try our luck. 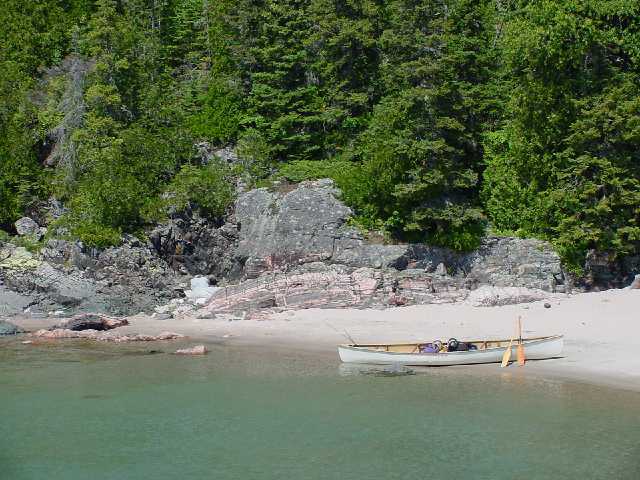 Our plan had been to canoe to Beatty Cove and then make our way down the coast to the falls and then take-out at our original put-in, a pleasant two-night journey. 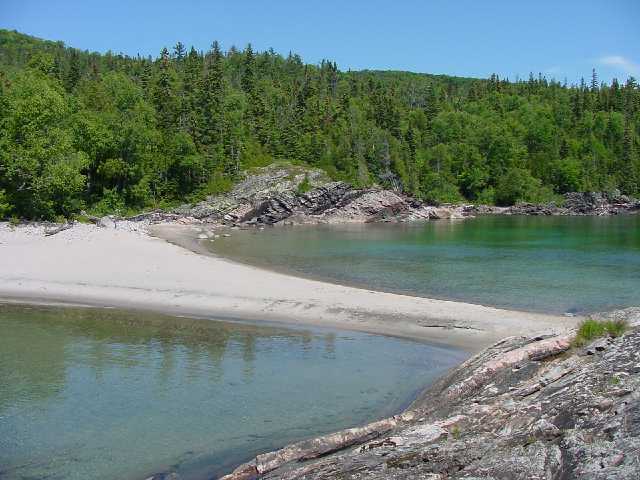 However, a "bad" bear had been reported at Beatty Cove, stealing food and even clothing, so we decided to head for another campsite in a beautiful cove, a perfect base for exploring. As we launched our canoe we felt incredible joy to be back north again, the city and work were behind us, there was not a soul in site, the lake was aqua and calm and our souls were uplifted immediately. Our destination was only a few hours away and we paddled happily along beside the unique coastline of twisted rock, cliffs, stunted trees, dark forest, hardy little plants clinging to the rocks like little miracles. Looking down in the water we easily saw boulders many metres below us. 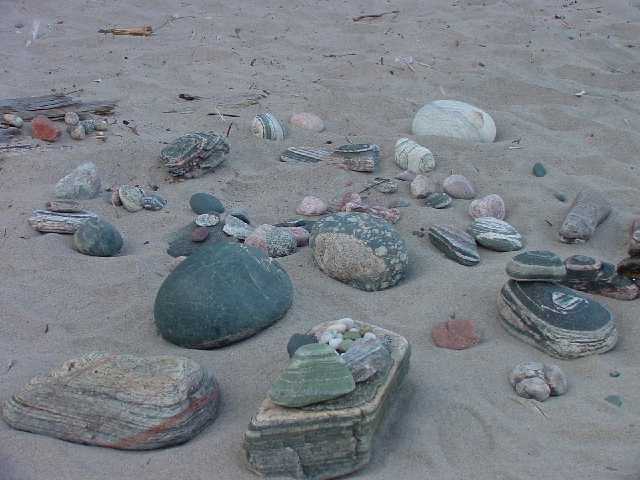 The rocks of the shoreline often continued their pattern deep into the lake, cracks and stripes of white quartz amazing us time and time again. The sun was shining and the lake was as clear and blue as the Caribbean. Unlike the tropics however. 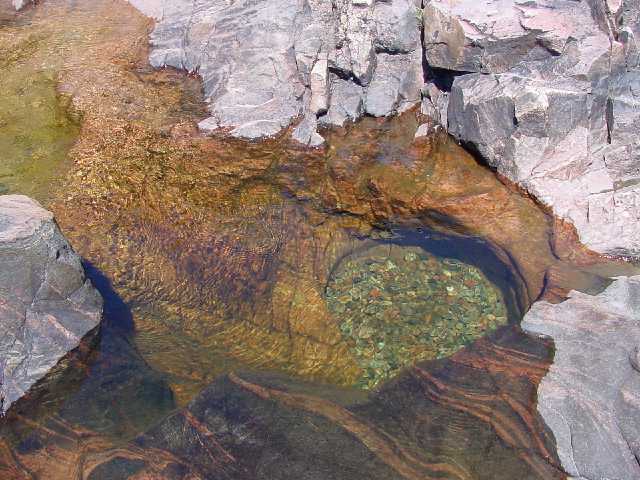 we knew the chilly depths of Lake Superior could sap the strength from your bones in minutes. You had to get really dirty and brave on a canoe trip before you would venture forth for a swim, or should I say dip. Eventually we arrived at what was to be our home. 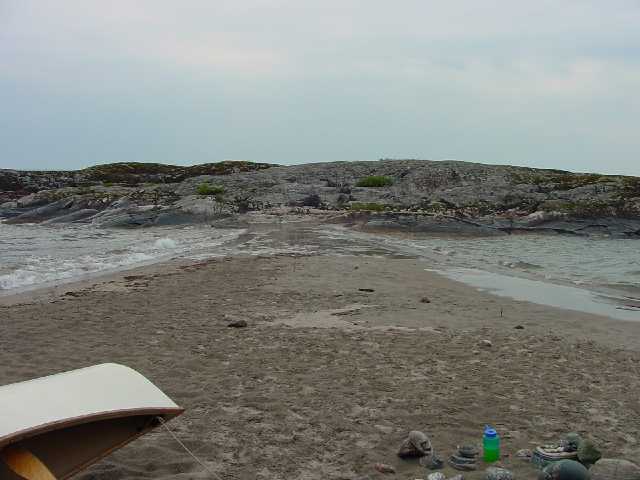 A small beach connected by a sandy tombolo to an outcropping of rock stretching out into the lake, protecting a pair of lagoon-like coves shielded from all but the fiercest winds and waves. Climbing up onto the rocks, we looked down onto our new home, two perfect little lagoons, beautifully blue and sandy. To the side was another boulder beach where we were to discover the most incredible rocks and stones of all colours, all worn perfectly round by the relentless Superior waves. 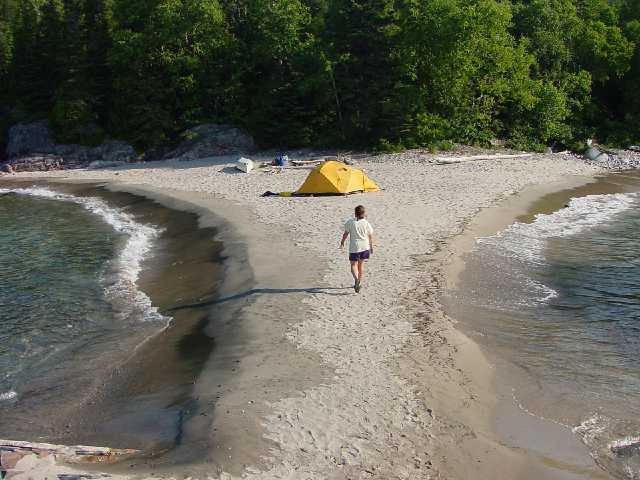 We pitched our tent in the middle of the tombolo, perfectly equidistant from Lake Superior at our front door and Lake Superior at our back door. Lying on my sleeping bag, I could see sand, gently lapping blue water, rocky shoreline and forest across the lagoon. The rest of the afternoon was spent just enjoying being back on the lake. The next day was perfect. A short paddle took us to the mouth of the Baldhead River and we followed the hiking trail up towards the falls. Some boulder hopping took us to the top of the falls and we spend the day admiring the power of the water, the tranquil pools, the white pouring water. Alas, no fish, that would have to wait for Quetico. Back onto the lake and again the water was calm with little ripples and a slight breeze. 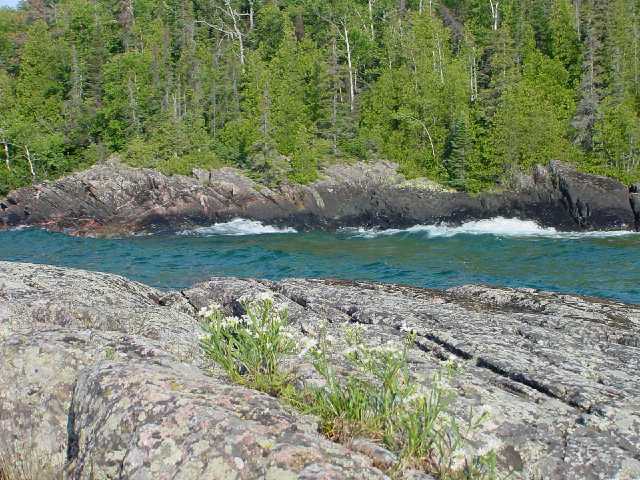 We were able to paddle right beside the jagged rocks. I keep hoping one day to see a lynx sitting atop a rock waiting for me, but they are illusive and rarely seen, although we often see hares, which have a much better chance of a lynx encounter. 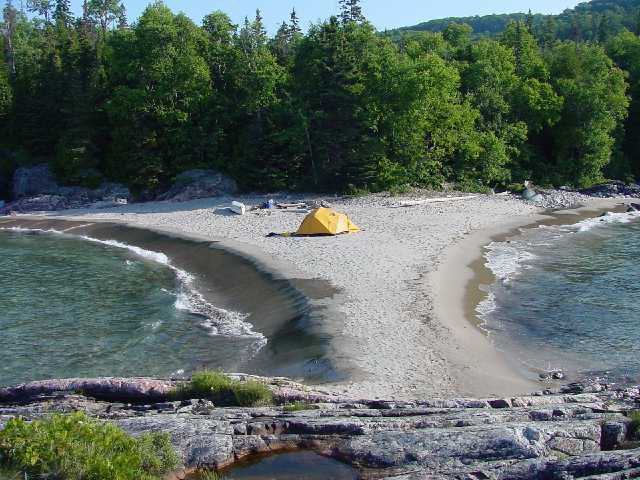 Back to our beautiful little campsite atop our sandy tombolo. Our biggest decision was where to eat dinner: on a driftwood log, beside our fire or out on the rocks watching the sun set in the west with yet another great sunset lighting up the sky. Our plan was to get a good start in the morning- we had a long drive ahead of us. We were tired, catching up on our sleep after a hectic school year, and a long drive north. 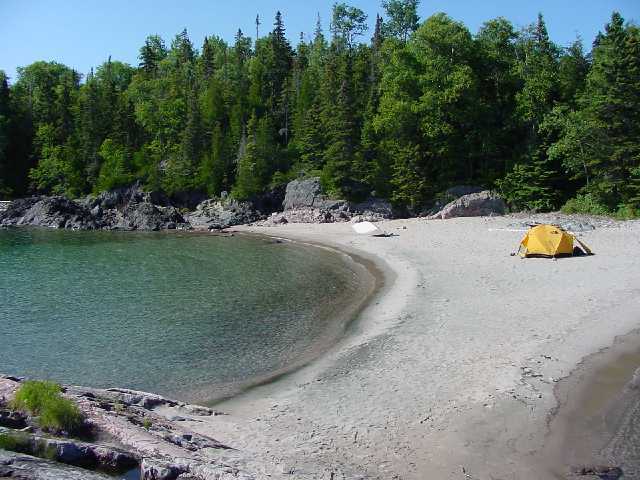 The wilderness had only begun to soothe us and restore our energy and we fell asleep to the sound of Lake Superior lapping at the boulders on the sandy shore. The next morning was different, very different. 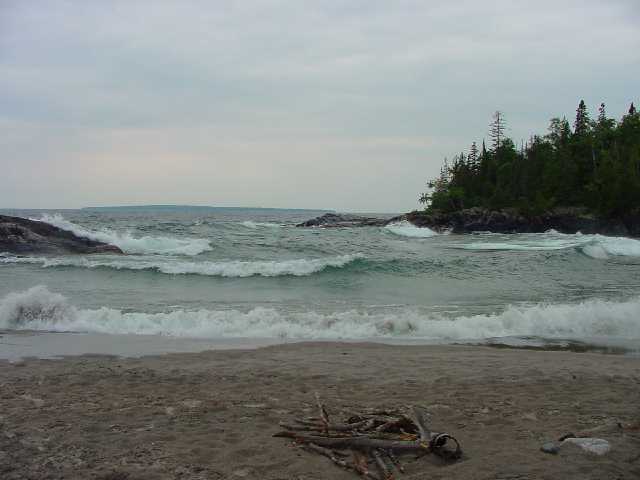 The gently lapping waves were now rollers and the lake was dotted with whitecaps and we knew we were not leaving any time soon. I put sticks in the shoreline to see if the waves were getting smaller and soon my sticks were afloat as the shoreline eroded and the sandy beach became very soggy. On both sides. The tombolo stretching out to the rocky outcrop was gradually getting smaller and our tent was perched in the middle. For the next eight hours we lay in the sun and watched the waves from the north and waves from the south and the waves coming straight t on. So much for a little protected campsite. We climbed the rocky outcrop and took digital pictures of the waves trying to catch the waves at their biggest as they assaulted the rocks. I had brought extra food so we didn't starve and good sense (for a change) kept us on shore. 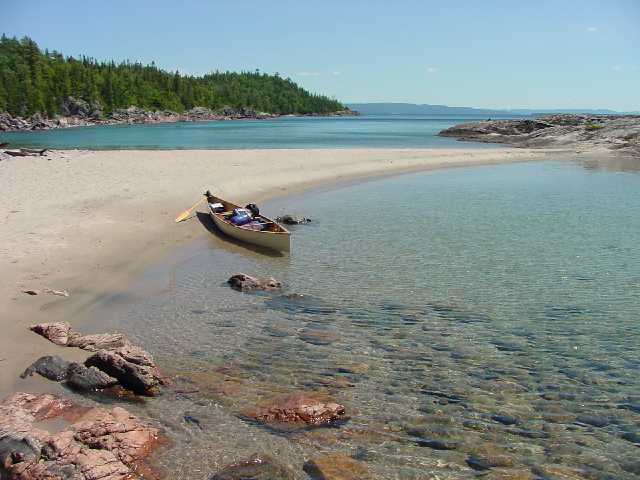 We know an open canoe can't safely ride a breaking wave and besides if you have to be marooned, what a better spot than on a pristine beach on the shores of Lake Superior. Our only company was a sailboat early in the morning and a pair of surfing mergansers. We had time to admire the boulders and pick a choice few that we would like to take home. As the evening approached, we began to make dinner but started to realize the waves were becoming huge and the last few were just a few feet from our tent. 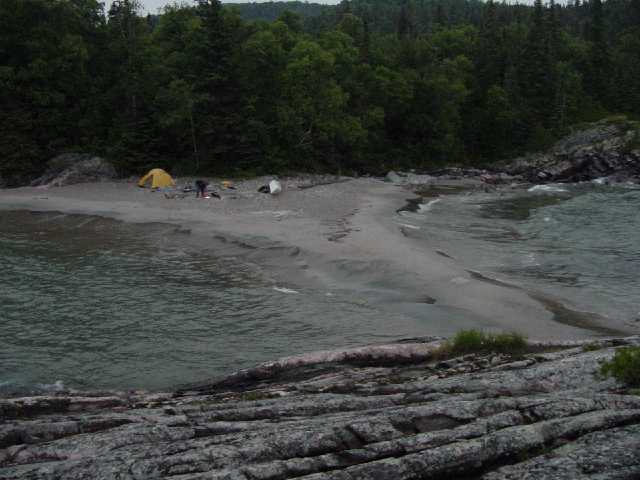 Se we picked up the tent and moved it far up against the rocks at the end of the sand and as we turned to face the lake a giant wave covered the footprint where our tent had been. The next half hour the lake erupted into giant surf. We watched in awe as rollers crashed into the shore. 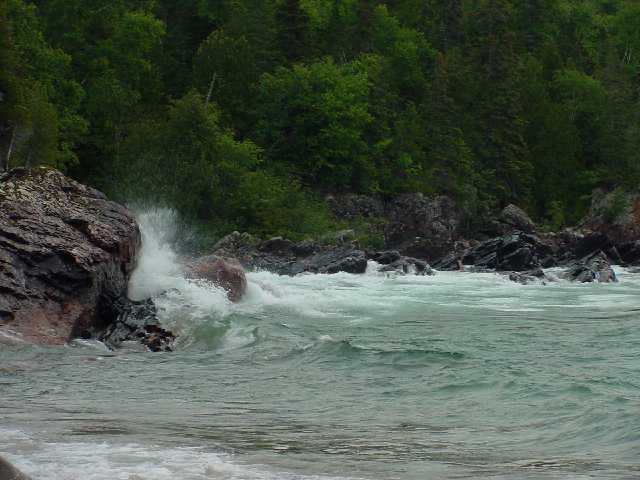 We were safe up from the waterline but Lake Superior could easily have been the Pacific Ocean crashing onto the shores of Hawaii. Just a little colder. And as the waves gradually became smaller, we looked at each other. She'd done it again! Never to be taken for granted, the biggest lake in the world, the most beautiful, the most thrilling and my favourite place to be, especially with the one I love. The waves calm down over night and we paddle through foggy, gentle seas back to our car. We have been lulled and thrilled. 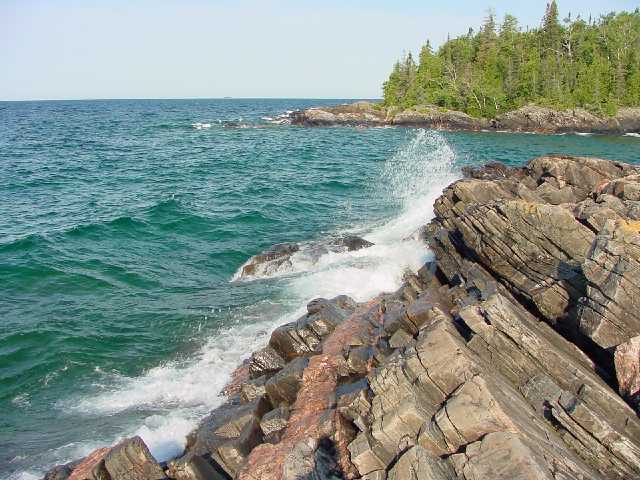 That's Lake Superior.